Just finished stitching out a small project for a fellow dressmaker, a knot patch. Learned a lot, as usual. I suppose I am an odd sight sitting in front of my embroidery machine watching it do its thing. No, I am not an idiot savant who is entertained by repetitive movement. As I watch, I learn more about embroidery, digitizing, fabric, stabilizers, thread, needles, etc. Listing thoughts for future reference. 1. All fabrics must be stabilized for embroidery and sometimes it take more than one layer and more than one kind. There were a couple of embroiderers on a mail list I used to belong to who believed that embroidery could be done on unstabilized fabric if it was hooped tight enough. Bull. If the stitches don’t have something to grab onto then there will be tunneling, and if the fabric cannot oppose the tension of the stitches there will be pulling, puckering, rippling, wrinkling and warping! There is no reason for any of that if stabilizers are used. And even then, you might need more than you think. 3. Compensation must be made for stitch-dense designs. I did not digitize the knot patch I just finished. I do not know who did. When I opened the design in my software, there was no reading for pull compensation. I decided not to add it to the design, but instead made adjustments to my machine for the densest parts. Almost perfect stitch out. I sent this example off to the dressmaker. Next time I will make one more tiny adjustment. 4. Forget automatic digitizing. This re-confirmed my feelings on this. My software can take a picture and automatically digitize the whole thing for embroidery and/or applique at the click of the mouse. I hate it – it is not intuitive, stitches run every which way, and the stitch-out logic is beyond me. Just like the knot patch. I did not start over (I do not have the original picture) but I did clean up as much of it as I could by adding stitches to fill in gaps and trying to simplify the stitching order. The needle was jumping all over the place, leaving areas unfinished to start other spots. Inefficient. I am getting organized here to begin some custom dresses. I will be digitizing Susan’s designs for these. This is the fun part. Her designs are never simple. A relatively simple-looking design is always a challenge in terms of what gets sewn down when and what overlaps what. Takes quite a bit of time and I love every minute of it. The rose at the beginning of this post is a perfect example of Susan’s design challenge for me. And for some reason I am reminded of posts made on a couple of the boards that compare hand-guided embroidery & applique to computerized machine embroidery & applique. The gist of the comparisons are that the machine embroidery is easier and faster and therefore should make the dresses cheaper. Hey, any monkey can press a button, right? Well, that presses my button! 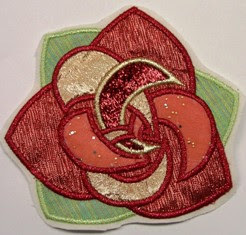 Yes, clean & sharp hand-guided embroidery and applique takes much skill. Susan is great at it. I am getting better; I will still rip something out if it is not even enough. There are so many pictures of dresses on the net right now, and I always check out the satin-stitching. It is obviously not a simple thing to do well. But using a computer does not make any of it faster or easier. I know that I (and any digitizing dressmaker) put in just as much time getting the design ready, prepping fabric, and then stitching out a digitized design as I do for a hand-guided one. In fact, because of the time I take digitizing carefully, it probably takes me longer. I want it as perfect as possible for the most professional look. The pics on this page are of large designs I digitized, all of which required re-hooping. I would do anything not to re-hoop, but mine is not a huge commercial machine so big designs must be re-hooped. If I wanted faster and easier, then I would click that button to digitize a simplistic patch and use it over and over on as many dresses as possible just as one BN (big name) designer does. And knowing as I do just how easy that is, it makes the prices for those dresses that much more obscene. In fact, from what I can tell from pics from the most recent major competitions, some of the BNs aren’t even bothering to put embroidery on the dresses at all! So what is it people are paying for? Such a whinge-fest…what is it I want? A pat on this clever girl’s head? No, I think that perhaps in my migraine-addled disposition, I am taking a bit of offense to Elizabeth Cady Stanton’s letter. Not really to the letter, but to the mindset of the letter that in its essence is still pervasive today. In this culture in the States, we are job snobs. We do not think that people who work with their hands are very smart. Of course we do see artists (not always including dancers, thespians and singers) and plumbers as exceptions to the rule – “artistes” can be too smart for their own good and plumbers make lots of $$$!!! But I know I frequently encounter a condescending attitude from folks when I say I am a dressmaker. (Occasionally someone asks if I have always been a dressmaker. They get really confused when I tell them I am a retired university professor…it does not compute!) And the comments about machine embroidery take that even further…these dressmakers only have to know how to thread a needle and push a button! So, why aren’t their dresses really cheap??!! Wait, I thought using computers made you one of the smart ones?! Ok, that took way too much brain power, but those popcorn thoughts don’t quit until I let them out. And what do I know anyway? I do not believe these stupid comments are made by dressmakers – none of us would devalue the work we know goes into these dresses. This is another creative outlet for me. It works for me and I have slacked off on going to the boards so the idiots won’t rile me so much. I like our new Yahoo group, IDDressmaking…nice folks, not really any anonymity. I am happy working in my sewing dungeon all by my hermit-self… with my computers and my hands. Previous Rose of Tralee 2007 Next Feisdress pattern: The physics of the skirt hang!